The Husband has been working strange shifts for the past few days and also over weekends so I have often been cooking just for me in the evenings. Because it’s just cooking for one, I tend to make something that’s quick, but I also try to be relatively healthy too. 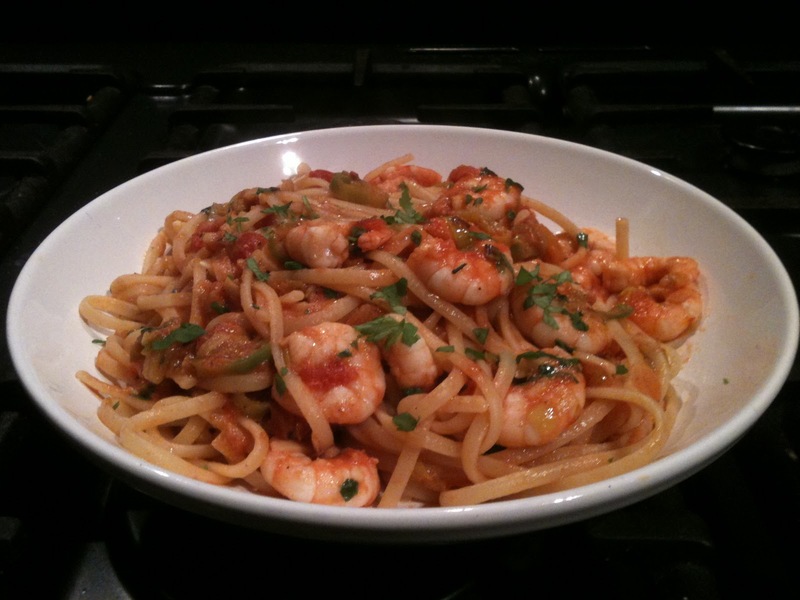 Continuing on a fishy theme, this week I made a very quick but tasty prawn linguine with chilli, lemon and parsley. Cook the linguine in a large pan of salted boiling water until al dente (approx 8-9 mins). Whilst the pasta has about 4 minutes to go, get another pan on a high heat and add the olive oil. once the oil is hot, turn it down slightly and then add the chilli, garlic and lemon zest. Be careful they don’t burn in the heat of the oil and after 30 seconds throw in the prawns and cook until they turn pink. Add the lemon juice and the tomatoes, season to taste and then throw in the parsley. Take off the heat as you don’t want the prawns to overcook. NB – if you are using cooked prawns, throw these in at the end of making the sauce and warm through. Drain the pasta, then add to the sauce. Serve with or without parmesan (I do) and maybe some crusty bread (I didn’t). A nice dry white would also go really well, perhaps a Marlborough Sauvignon Blanc.